Do we really want to follow a Tory model of low-spend? Don’t be surprised to see loss of competitiveness, poverty, inequality and poor public services dominate the headlines over the next few years. We are potentially heading down a dangerous stretch of road ahead – leading us into the Ultra-Low spend zone. In this zone, investment declines and, so competitiveness and productivity; health and education services suffer; income supports falter adding fuel to the inequality engine. A low-service, low-waged, low-productivity future awaits. Of course, spending a lot of money doesn’t guarantee you optimal results. But spending too little certainly won’t get you optimal results. So how far behind are we falling? Let’s compare public spending (excluding interest – this is called ‘primary’ expenditure) in the EU-15 countries. I’ll use the method devised by Seamus Coffey who hangs out at Economic-Incentives. He excluded elderly-related expenditure and then compared Ireland with the rest of Europe. He did this because Ireland has an advantage here – we don’t have to spend as much on pensions and related expenditure because we have a smaller proportion of elderly. In the EU-15, the over 65 cohort makes up 19 percent of the population; in Ireland, this cohort makes up 13 percent. 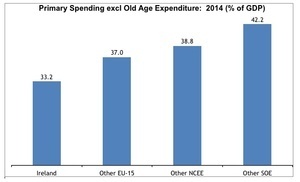 2014 is the latest year we have data for old-age expenditure. 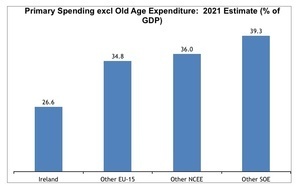 In the following, old-age expenditure is subtracted from total primary spending. For instance, Ireland spent 37.2 percent of its adjusted GDP (adjusted per the Irish Fiscal Council’s hybrid-GDP estimate that factors in the accounting practices of multi-nationals). It spent 4 percent on the elderly, leaving an expenditure level of 33.2 percent excluding elderly-related spending. Figures for European categories are mean averages. Ireland ranks below all the European averages. What difference would it have made in 2014 in actual Euros and cents? To reach the average of other EU-15 countries, we would have had to increase public spending by €6.5 billion. The next comparison is with other Northern and Central European economies (other NCEE). This is the EU-15 excluding the poorer Mediterranean countries like Greece and Portugal. To reach this average, we would have had to spend an additional €9.6 billion. The final comparison is with Other Small Open Economies, a category used by the IMF. These are economies with a small domestic market and a high reliance on exports. Austria, Belgium, Denmark, Finland and Sweden are in this category. This is arguably our peer group. To reach this average we would have had to spend an additional €15.5 billion. In 2014, it could be argued that we are already a low-spend economy but as I wrote here, the situation could actually be worse. I have reservations about Seamus’s method. Excluding old age expenditure not only removes the demographic driven part of overall spending, it removes policy choices. Most other EU-15 countries spend more on elderly per capita than we do. Second, if we are to adjust for the elderly population, then we should also adjust for youth demographics. In Ireland, under-20s make up 28 percent of the population, compared to 21 percent in the EU-15. And we are a low-spender when it comes to education. EU-15 countries spent 5.3 percent on education, Ireland spent 4.7 percent. We have a third more children than the EU-15 and spend more than 10 percent less. Therefore, when these are factored in, I fear we will have fallen even further behind. But let’s stick with Seamus’s method. Besides, those calculations above were then and we are heading into an even worse situation. Let’s fast-track to 2021. Here, I use the IMF estimates. There are certain assumptions we will have to make. First, that the interest expenditure throughout the EU-15 – 1.5 percent – applies to each country (it won’t but it will average out). Second, that expenditure on old age remains constant. This will almost certainly change but in all likelihood, spending will increase in Ireland faster than in the rest of the EU-15. The 2015 Ageing Report estimates that the number of pensioners over 65 years will increase by 17.5 percent in Ireland between 2013 and 2020 compared to a growth rate of 10.9 percent. We will still have a demographic dividend but the higher growth rate will result in higher spending. And we will have more students in 2020 while the number of students in Europe will fall. So, if anything our demographic driven spending will rise faster. Third, we assume that 75 percent of the fiscal space will devoted to public spending, or €8 billion. So what is one possible future, based on the IMF estimates? By 2021 spending in Ireland collapses, falling well behind other European averages. To reach the average of other EU-15 countries in 2021 we will need to increase spending by €21.2 billion. To reach the average of other Northern and Central European economies, we will need to spend €24.4 billion. To reach the average of other small open economies, we will need to increase spending by an incredible €33 billion. These should be treated as indicative as they are based on assumptions and estimates. Will other EU countries increase or cut spending? Will spending on old age rise faster or slower? However, we do know from the Government’s own projections that primary spending will fall from 34.2 percent in 2014 to 24.7 percent of GDP between 2014 and 2021. Add in the spending from fiscal space (2.8 percent) and the fall is still substantial. As I stated before – it’s not all about increasing spending. We need to spend more efficiently with greater accountability and transparency. But even if we were to be the most efficient spenders in the EU, we would still end up being one of the lowest. The only other country that comes close to us is the Tory-led UK. Do we want to follow a Tory model of low-spend or a continental model? If we want the former, don’t be surprised to see loss of competitiveness, poverty, inequality and poor public services dominate the headlines over the next few years. But if we want the latter – a continental model – then we not only have to reject proposals for tax cuts, we need to begin a debate over which taxes we are going to raise. And we better start that debate now, before we find ourselves stuck in the Ultra-Low Spend Zone. Posted in Misc and tagged Michael Taft, taft on tuesday at 1:55 pm on May 3, 2016 by Admin. So long as the rich, the banks and the corrupt prosper the blushirts will feel that a job has been well done. Your charts appear dishonest. The scale on the axis of the bar chart is obscured so we can’t be sure what is happening, but it all looks a little funny. In the first, the 9% points of difference between Ireland’s spending and ‘Other SOE’ is half as large as the 33.2% afforded to Ireland. This gives the visual impression of Ireland being further behind. In the second, Ireland’s 26.6% is about half as large the 39.3% of ‘Other SOE’ when of course they should be far closer in size. Not starting from zero, which may be the reason, is, to my mind, just as dishonest. You argument is undermined by these silly visual tricks. It is a perfectly legitimate approach. If the chart started at zero it would be very difficult to see the differences – which is the whole point of the chart. For bonus points Michael includes values as labels. So anyone at home can make their own chart to their own scale preferences. Obvious BS I’m afraid. You are debasing our ability to interpret the data and effectively calling the audience too stupid to make up their minds without strong visual cues. Give us the scale and let us make up our own minds. As you know, if the scale was provided more people would be upset. Saying you can make up a scale at home with your own scale preferences is dishonest to say the least. There is a standard ratio 1:1 and chart format (x and y starting at 0). That you were so quick to reaffirm this less than perfect approach in such strong terms tags you as a fan boy or girl and destroys your credibility. Sorry. It’s not BS, if you look at any statistical report in economics, environmental, sport, whatever, this technique is used everywhere. If you were to show a comparison of figures where one was 15 billion, the other 10 billion, and were to start the axis from 0, the chart would look ridiculous. Eh, no. If it was counting in 1s maybe, but the chart could just use a billion as the basic unit… Then the 15 would be half as big again as the 10 and we would all say oh, that is in the correct proportions. Strange stuff. This article is very well made Michael. -Where Ireland’s spend is REALLY low is on public capital. This is now 65 population growing 3% pa and >85 population growing 5% pa. These groups do okay out of income-contingent transfers (pensioner poverty is low) and this is a good thing. But a lot of benefits (medical cards, free travel, tax credits, household benefits package) kick in at 65, 66 or 70 for EVERYONE including the elderly rich. This is both very costly and is bad for social solidarity. Essentially no-policy-change in the next few years means the state spending a lot of money on transfers to some and proportionately less on services for all – this is the accidental legacy of the crisis and should be given proper consideration by policy makers. Some of my post got chopped. Here’s what should have been in there. Public capital spend got chopped between 08 and 13 (despite popular belief in austerity this was the only sector of government spend to show an appreciable decline). It is now <2% of GDP, down from 5% in boom times and in or around the same level as Greece. Yes, we don't need to build motorways again. But we do need to build large, modern, high-spec hospitals and a metro in Dublin. But all that you can do with 2% capital spend is essentially replace worn-out stock, not build anything new. This is at a time when the population is growing and will grow even faster once net outward migration halts. Michael is completely right that the next few years will see the pips beginning to squeak in public services. The easy option would be just to increase pay, but that will only do so much good if the physical capital to deliver services is not there. Sadly it may already be too late. Proper public infrastructure takes a long time to plan (much longer than the electoral cycle) as the saga with the new national children's hospital shows. Fact Checker- thanks for that. Yes, investment very low. I’d put all the fiscal space there (after reforming the planning process). Interesting thing about old age spending. Ireland has a reasonbly high entry payment for OAP. However other countries have a pay related rate which means universal coverage through social insurance. Good to have both. The current model for public investment is ‘spend-it-when-you-have-it’. There are indeed multi-annual capital envelopes but no real proper approach to asset management. DES gets €xm for school buildings and the schools that shout loudest get the new buildings. Ideally dull things like road maintenance would not be subject to the fluctuations in the public finances and would be funded directly from user charges or motor taxation. 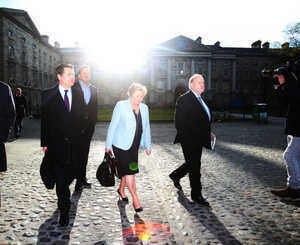 Most don’t, but FG do, and even though they only have support of about 35% of the people, they get to call the shots. They all recognised that by the arithmetic of the seats, that no government could be formed not lead by Fine Gael or Fianna Fail – and are ideologically opposed to propping up either of those parties. It’s called having actual principles. Well, in fairness, the people accusing AAA, SF etc. of being full of bluster and not pulling on the green geansai know full well this is why said parties aren’t taking the bait, and still gas on as they have nothing else to throw at ’em in that regard, in fairness. There has to be something left after FG and FF cannibalise themselves/each other. Most don’t but at the same time, most are not willing for upping the taxes to ensure that that we have a higher spending model. We are in a weird place where we want the Scandinavian model but without the tax rates that come with that. What is it when you include PRSI and USC.. 52% on everything over 33,800? IRISH TAXPAYERS EARNING €75,000 give the government a larger share of their income than workers in Sweden. Education is seriously underfunded and standards are getting worse in Ireland. Ireland’s spend on education is the third highest in OECD (2014 figures), but I imagine that is due to the relatively-high salaries paid to teachers. When discussing education most commentators focus on the inputs (annual government spend) and not on the outputs. Outputs are at a superficial level things like % of early school leavers, share of tertiary education in the population, etc. Ireland has been doing very well at these things and is a leader internationally. Since the 80s tertiary education has been extended to pretty much everyone who wants it. There will at least be an IT within an hour’s drive and entry requirements are low. The most important outputs however are how well adults perform at certain tasks. The OECD did the first survey on this called PIAAC two years ago and the results are not pretty for Ireland. Adults performed 18 out of 21 countries on literacy and 17 out of 21 on numeracy. Capacity at problem solving in technology-rich environments was pretty poor too: (http://gpseducation.oecd.org/CountryProfile?primaryCountry=IRL&treshold=10&topic=AS). Reform is needed to the education system to address these deficiencies. I am not an expert in this field so can’t proffer advice. Nevertheless I suspect what needs to be done is not much related to teacher pay or school buildings. 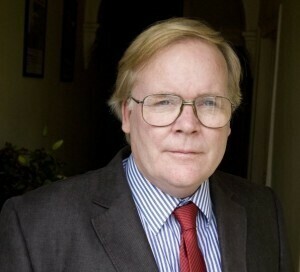 Brilliant, erudite and insightful argument and article Michael – thank you for this. theres no way out.. ive tried making it work. i have a good salary, but i only get half of it, and they wont stop til they get even more of it thru water, and im sure they wont stop there. and by the looks of it, its never going to get better. ive really really tried, but it looks like im guna have to move country. M8 how u ave gud salary when u spelz “going to” guna? ?